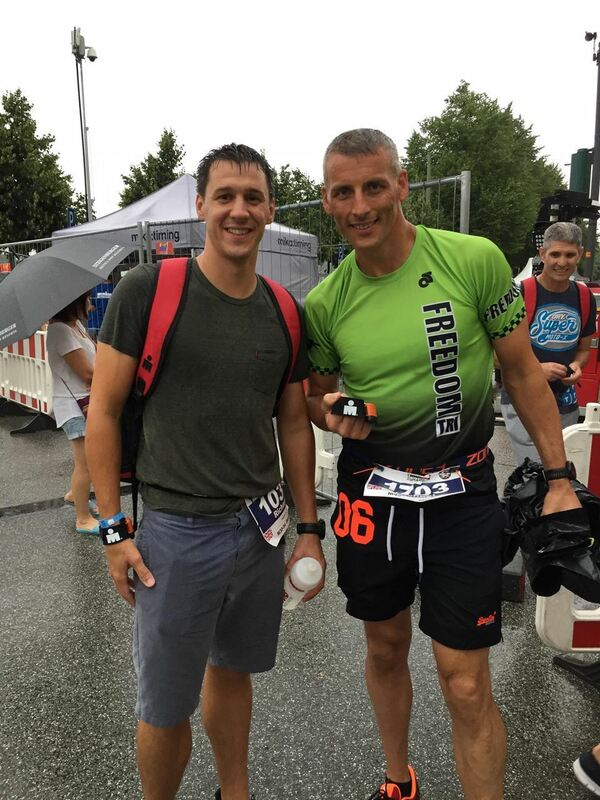 This weekend long distance first timers Michael Day & Richard Springall headed out to Germany to take part in Ironman Hamburg. Sadly due to blue-green algae conditions in the Alster the organisers cancelled the swim split and replaced it with a 6km run loop, effectively turning the race into a duathlon. Undeterred by this last minute set back, Michael completed his first ironman race in a fantastic 9:44:35 him 545th overall and 85th in his 45-49 age group. Richard raced home in 10:09:08 making him 789th overall and 116th in his 30-34 age group. Also this weekend GB athlete Chris Belcher was braving a 14 degree sea swim at the Redcar Sprint Triathlon, a qualifier for the 2019 World Championships in Lausanne. Chris finished 17th in his age group in this draft legal event, with a speedy time of 1:11:21. Go Chris! Richard Springall & Michael Day at Ironman Hamburg. Suzy Hawkins has smashed yet another Ironman race (3.9km swim/180km bike, 42km run). This time at UK Ironman Bolton. With an amazing time of 10:21:32 she was 175th, 3rd in her age group & 11th female overall. James Thomas was next for Freedom Tri in 10:37:44 239th, 43rd in his age group followed by Alan Barker in 11:57:58 680th, 138th in AG and Dave Ball in 13:56:12 1414th, 269th in AG. Well done to you all! 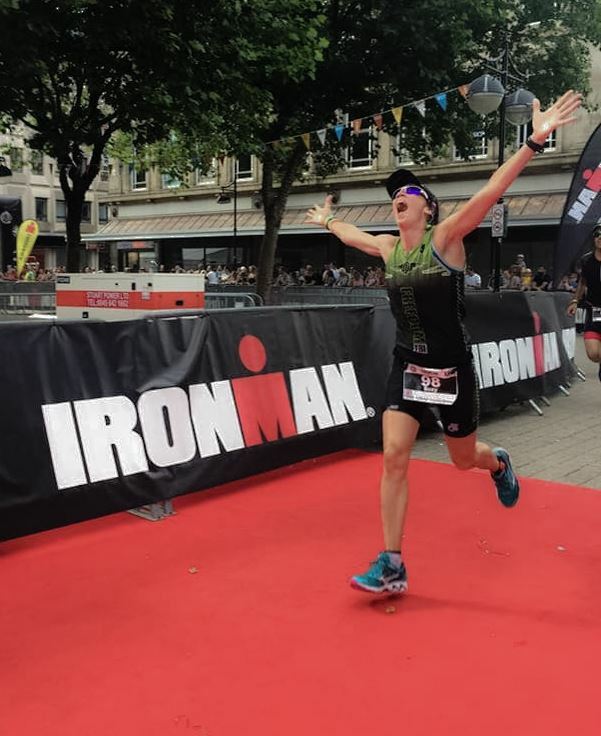 Suzy Hawkin's victory salute as she comes 3rd in her age group at Ironman Bolton. Meanwhile James Parsons was taking in the picturesque countryside at the the XNRG Chiltern Ultra Challenge. Running 31 miles/52km in one day with 949m of ascent, this was going to be a tough day. James placed an outstanding 4th out of 259 finishers in 4:33:12. Awesome! 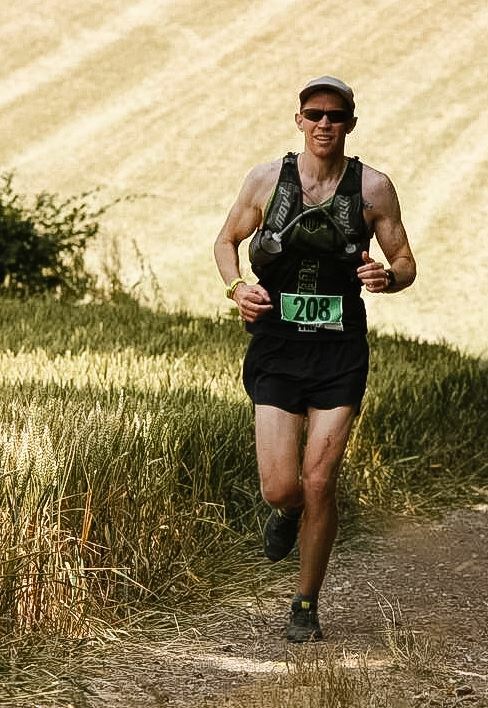 James Parsons who placed 4th in the Chilterns Ultra Challenge. With the spectacular backdrop of the Snowdon Mountain range, the historic Dolbadarn Castle and Welsh quarries; Llanberis Lakside was the setting for this year's Big Welsh Swim. 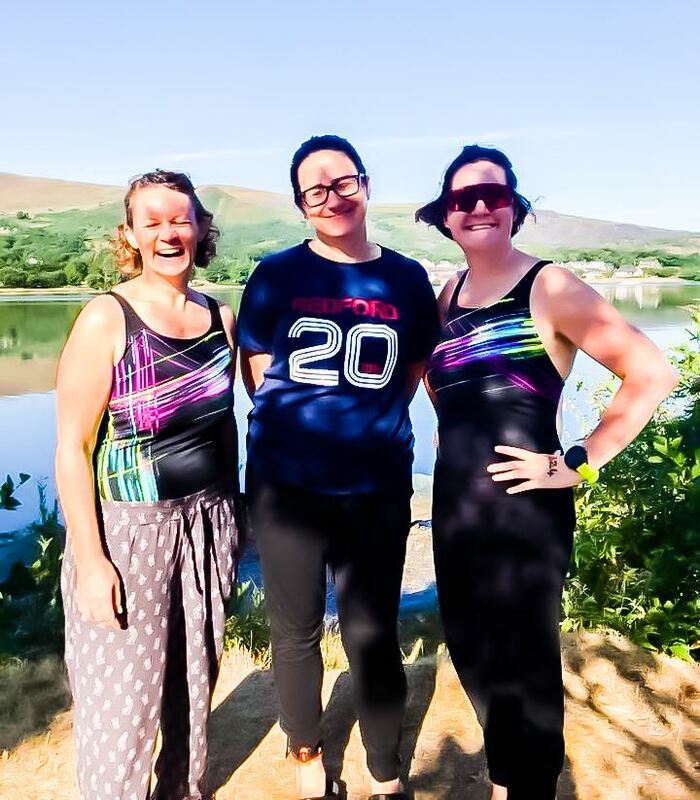 Swimmers caught the narrow gauge train to the end of Llyn Padarn to the start and chose to swim either a length of the 3km lake, once, twice or even three times! In the 6km race Emma Croxon was 42nd in 2:35:35 (5th AG); Liz Aitken was 53rd in 2:50:29 (6th AG) and Sara O'Callaghan was 61st in 3:15:40 (9th AG). In the 3km race Sarah Taylor was 83rd 1:31:30 (10th AG). Sara O'Callaghan, Liz Aitken and Sarah Taylor at the Big Welsh Swim. Last Sunday saw Jake Amos and his Hitchin Hares host the 2nd edition of the Hitchin Tri at the Hitchin Swimming Centre outdoor pool. As the early morning sun slowly crept over the tree tops, nervous chatter intermingled with the trickling of the art deco fountains. The 50m pool was laned off and ready for the first 400m leg of the race. 7.00 am and the gun went off. After a quick swim exit the athletes were sent out on a gently undulating 20km bike leg ending with two laps of the town centre incorporating Butts Close. As is customary these days, Freedom was well represented with some fine performances. Ryan Nicholl was 3rd in 1:02:18 (1st in AG); Richard Springall 6th in 1:04:57 (4th AG); Steve Carrod 18th in 1:08:38 (9th in AG); Luke Nicholl 22nd 1:09:32 (2nd AG); Helen Cairns 50th in 1:14:34 (1st in AG); Andrew Fenton 145th in 1:31:05 (23rd in AG); Stephanie Merison completing her first ever triathlon 150th in 1:32:03 (16th in AG) with Emma Clark 161st in 1:36:42 (20th in AG). Unfortunatley Toni Fenton had to pull out after the bike leg. Stephanie Merison enjoying her first race at the Hitchin Triathlon. 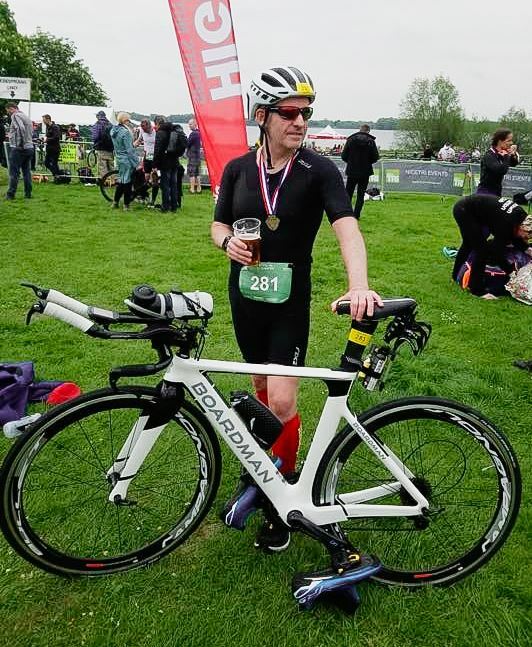 Earlier this month Chris Belcher placed 9th in his age group at the Thorpe Park Sprint Triathlon Championships in a time of 1:07:58. 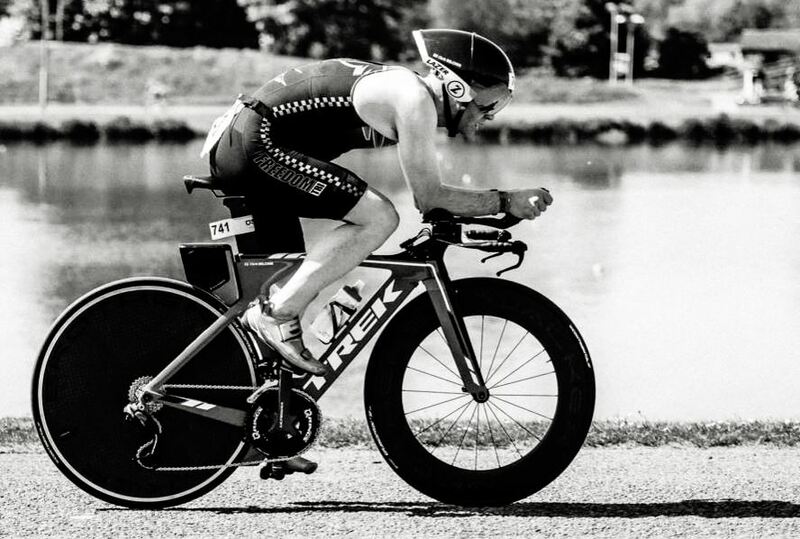 With an impressive 14th place coming out of the swim he rapidly moved up the field to post the 7th quickest bike split, topped off with a 19:46 run split. Chris hopes this performance will put him in a qualifying position for the ETU Championships to be held next year. We wish Chris the best of luck in his pursuit of qualification! Both Sean Trimble & Rachel Kelley conquered Ironman Staffordshire 70.3 last weekend. The race kicked off with a 1.2 mile swim in Chasewater reservoir followed by a 56 mile bike through Lichfield, Burton-on-Trent & Cannock Chase with the final half marathon run through Stafford town centre. Sean completed the race in 6:15:44, 1171st place (80th in AG) whilst Rachel finished in 6:05:57, 1033rd place (21st in AG). 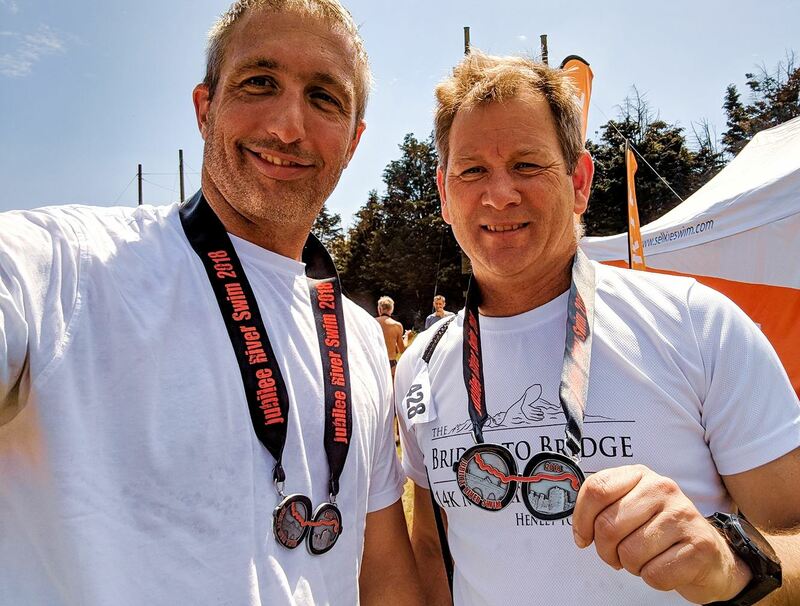 Meanwhile Mark Whittle (aka Sparky) & Andy Jones were having a splashing time at the Jubilee 10km River Swim in Windsor. From a large field of 425 swimmers Sparky finished this exhausting wetsuit swim in 2:18:35 (14th in AG) in an excellent 29th place whilst Andy finished in a highly respectful 2:48:38 (76th in AG) in 169th place. Andrew Jones & Mark Whittle at the Jubilee 10km Swim. Well done everyone, what a great day's racing!! Angela's troops were out in force on Wednesday showing those running clubs how it's done on Willian's 6 mile course. Overall Freedom came 3rd out of 7 scoring teams with 9 points. Men's race Freedom 3rd out of 9 teams (5 points). Women's race Freedom 5th out of 11 teams (4 points). Men's Freedom Vets 6th out of 9 teams (3 points). Women's Freedom Vets 5th out of 17 teams (4 points). Well done all who ran! 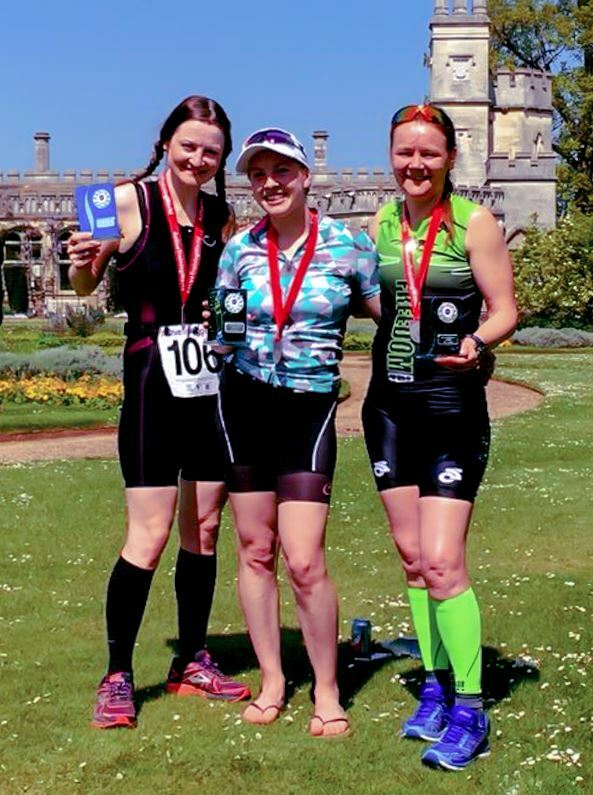 “Simply stunning” were the words used to describe the venue at the Grafman Middle Distance Triathlon (1.2 mile swim/55 mile bike/13.1 mile run). Located in the heart of Cambridgeshire, near the ancient Village of Buckden & St.Neots. The Grafman is well established within the triathlon community. This event continues to grow, recently being voted National Event of The year 2014 and being selected for the Triathlon England Middle Distance Championships 2015 and British Championships 2016. 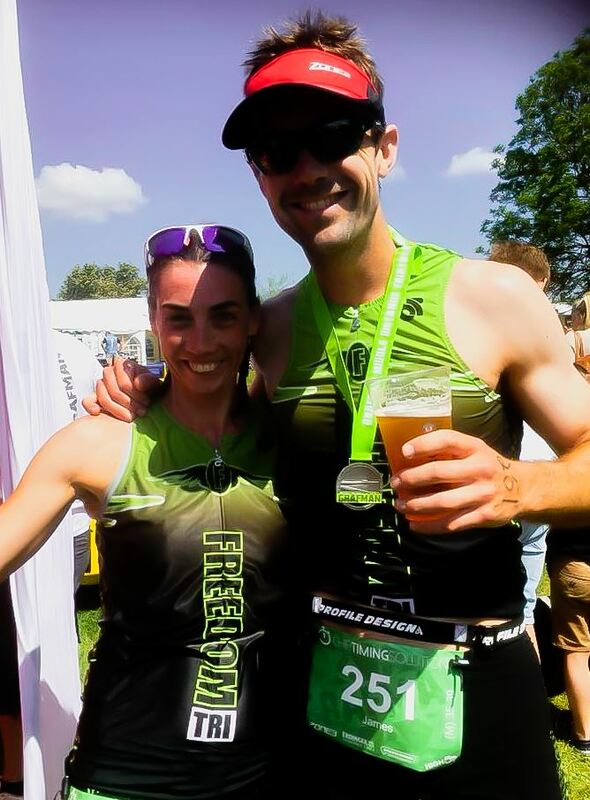 Freedom Tri despatched a crack team of athletes to fight off the competition and make their mark flying the wings of green. In the women's race Suzy Hawkins who is having a great season so far came an incredible 2nd (1st in AG) with a time of 4:55:40 whilst Amanda Maylin was 76th (12th in AG) in 6:58:22. Over in the men's race Ryan Nicoll was 88th (17th in AG) in 4:58:01; James Thomas was 89th (18th in AG) in 4:59:07. Suzy Hawkins & James Thomas at the Grafman Middle Distance Tri. Further afield Chris Belcher was racing hard at the European Triathlon Union Sprint Qualifier in Nottingham. The National Water Sports Centre is the perfect venue for testing yourself on a perfectly flat course where the tempo is high and the competition is fierce, but friendly!! Chris was very pleased with 89th place (15th in AG) in a time of 1:03:38. Chris Belcher at the ETU Sprint Qualifier. 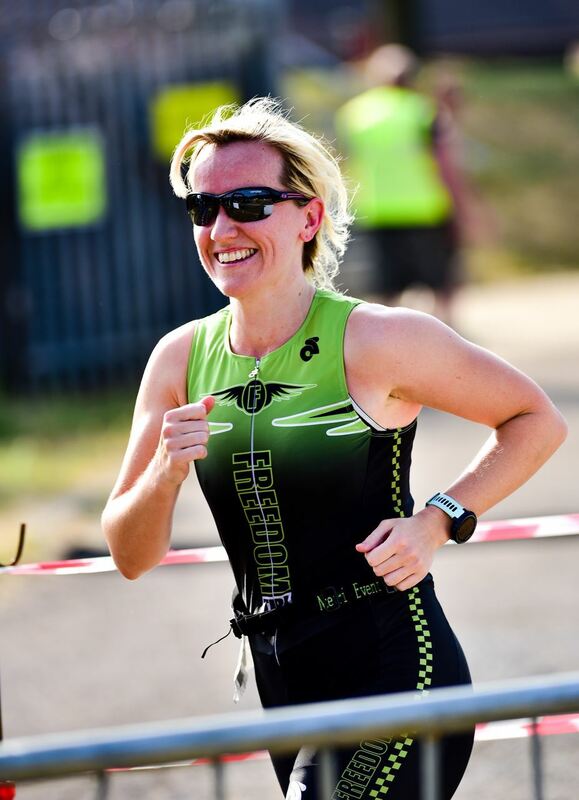 Finally Jodie Wilkes had a cracking weekend shaving an awesome (cue drum roll) 11 minutes off last years time at Eton Dorney with Human Race at their 'Sprints Weekend'. She crossed the line in 179th place, an excellent 2nd in age group with a time of 1:24:44. Congratulations Jodie!! Inspirational triathlete Ann Tryssesoone was exceptionally pleased to land a fantastic 25th place at the Ashrige Duathlon (10k/44k/5k) last weekend in a time of 3:00:27. She was third placed lady and first in her age group too. As you all know Ann is tuff as nuts and this result goes to prove it! Keep up the hard work Ann!! Ann Tryssesoone celebrates 3rd lady at the Ashridge Duathlon. With a last minute switch to Grafham Water the St.Neots Standard Tri (1500m/45k/10k) kicked off Nice Tri’s 2018 season, with many athletes competing for a GB squad placing. Back from injury last year, Sean Trimble who is currently in build up to Ironman 70.3 Staffordshire completed the race in 2:39:14 (23rd in AG), whilst Anthony Smith finished in 2:47:11 (39th in AG). Sean Trimble relaxes with an energy drink after the St.Neots Triathlon.